I REFER in this case not to one of the opening chapters of the Fellowship of the Rings, but in fact to the September edition of Trends in Microbiology, in which a Dutch research team lead by Luis Lugones describe some interesting work with mushrooms. Building upon an earlier patent by Lugones, the paper by Elsa Berends1, proposes for the first time the use of mushroom-forming fungi (the basidiomycetes) to produce N-glycosylated therapeutic proteins, an important class of protein-based therapeutic drug that represent a multi-billion dollar market. ‘Glycoproteins’ (proteins that have been processed by attaching a small string of sugars) are often prescribed to plug gaps in the metabolism of patients who for various reasons were born with, or have developed, errors of metabolism; these include insulin for treatment of diabetes, erythropoietin for treatment of anaemia, blood-clotting factors for haemophilia and a further 93 products (as of 2007). I HAD barely started reading this week’s edition of Nature when in the Research Highlights1 section a study really piqued my interest. Surgeons operating to remove malignant tumours often struggle to differentiate such tumours from surrounding healthy tissues. To ensure the complete removal of a tumour, surgeons also need to remove some of the surrounding healthy tissue, which of course isn’t desirable, especially in the brain. A surgical electrode is a popular means to bisect (cut out) tissues. 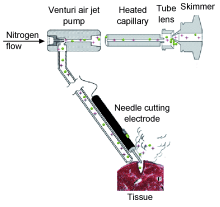 This makes use of a high-frequency electric current that is focussed into a highly localised ‘blade’ that effectively evaporates biological tissue as it comes into contact: water in the cells rapidly boils, proteins are precipitated and the membranes of the cells disintegrate forming a gaseous cloud of molecular ions of the major tissue components. An innovative study published by team of researchers in Budapest, lead by Zoltán Takáts2, makes use of the fact that thermal evaporation of different tissues results in gaseous clouds with potentially different ion signatures. The team coupled a suction tube to a surgical electrode, and when cutting begins the tube draws the ions into an instrument called a mass spectrometer, something with which all CSI fans should be familiar. Using this process Takáts’ team found they could differentiate between healthy and malignant tissues, which provides a great basis for real-time tissue analysis under the knife, so to speak. A THESIS in the current edition of Nature Nanotechnology addresses the tricky minefield of scientists’ objectivity; the premise being that, on the basis of several lab studies carried out by social scientists, science is more subjective than many scientists realise. Such lab studies stem from the desire to understand the creation of scientific knowledge from within the scientific community, which is certainly a worthwhile subject of study, but then again, if you were to walk into an operating theatre halfway through a bowel resection, you might think they were actively butchering the poor patient. I would thus err on the side of caution before leaping to conclusions about the validity of science on the basis of such sociological discourses. There is this rational scientific ideal where, in order to be as objective as possible, we withdraw from our personal identities (nationality, gender, religion), thus diminishing our individuality and, consequently, our subjectivity. This of course sounds like a lab full of robots, and frankly the idea of working in a lab with a bunch of emotionless, predictable automatons makes me shudder. Then again, some of us do, and I’d love to hear how that works out for those people. Fortunately, the thesis continues, most lab studies are closer to Traweek’s than Pickering’s, yet despite the differences in their conclusions, both studies address a mild concern of subjective values and practises. BACTERIA can find themselves in the rather undesirable position of being addicted to parasites. The parasites in question are not of the blood-sucking sort however, but rather of the gene-sucking sort. genomic islands (again, a collection of genes that usually encode particular functions – disease-causing factors or antibiotic resistance – that have arrived from another organism and have become fixed in the chromosome). We also have integrative conjugative elements (ICEs) that, like conjugative transposons, insert themselves into the host’s chromosome where they are replicated along with the host’s DNA, but then periodically (often under stress) cut themselves free and mail a copy off to another host cell. Transfer of any of the above genetic entities can result in a bacterial cell acquiring new and desirable traits as such as the ability to consume new food sources, or resist antibiotics, or be more invasive. These traits have been picked up via the many occasions that these elements have jumped into and out of bacterial chromosomes, taking bits of those chromosomes with them. The transfer of new traits by these genetic entities is referred to as Horizontal Gene Transfer (HGT), which is a term that is perhaps easier to understand if we consider that sexual reproduction, the process by which your parents produced you, is a form of vertical gene transfer; so too is the division of a single bacterial cell to produce a copy of itself and a ‘daughter’ cell. By comparison, horizontal gene transfer might be likened to you reaching out to touch your cousin and acquiring his or her ginger hair and freckles. The thing that unites these genetic elements is that, being parasites, they need the host cell in order to produce more of themselves. Sometimes these elements don’t provide anything useful to the cell, sometimes they’re more of a burden, but some of these genetic parasites have evolved ways to ensure that the cell doesn’t toss them aside. THE thing about being a practising scientist working in academia is that when such a practising scientist decides they want to write more about science in general, they remember that academia is a toxic gas that expands to fill all available space. We might hope for reprieve from standing at the bench, just a small amount of time to get a handle on our writing, a quick moment to imbibe some of the multiple streams of information from emails, journal table of contents, RSS feeds; alas, the moment a window opens, it is filled with responsibility. This may come in the form of the help you promised someone when you next got a chance; or hunting down an expensive enzyme in neighbouring labs, of which you require a mere fraction of a unit for a throw-away experiment; it could be trying to find a journal article with some essential information, rather than one that is actually interesting. Alternatively, you may just sit and stare into space, your brain already so depleted of sugar that you are protocolling on auto-pilot. Having filled your day with preparations for experiments, and the remaining 5% of it getting to finally do the experiments, you turn your attention to your student, who is working on a completely different project, with its own set of unique and inconvenient problems, and for which you must but don’t have answers. Having finally left the lab, if you’re lucky, you’ll manage to get home in time to cook some award winningly simple food (credit us with some respect, some of us do cook from scratch), which is invariably eaten in front of the computer while you finally get to sift through the now ridiculously over-burgeoning information stream, which now includes – lucky me – about a million twitter entries and their links. Ultimately, if you’re not ready to go by 2 am, you have two choices: either spiral into pit of information overload, eyes glazing over as the numerous ideas that pop into your head leave just as fleeting and unformed as they arrived; or sleep. There are of course some researchers out there who do manage overwhelmingly with both their professional and private pursuits, hell, I even manage it myself sometimes. But right now, I need a week’s worth of sleep.